One of the major source of viruses, trojans and worms that infects online and offline computers is the removable disk such as thumb drive. These plug 'n play disks are common origin of a virus infection due to Windows auto-run feature. Windows by default automatically runs the autorun.inf on the thumb drive and if this file contain a script to launch an infected file from the drive then the infection start. To prevent this from happening you can use Autorun Kicker which is a portable free application that monitors all drives and prevents autorun.inf virus from infecting the target machine. It fights the virus by cleaning all associated files on the autorun.inf. The app will alert the user by displaying ballon notification every time an autorun.inf virus is cleaned. 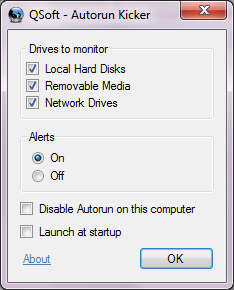 You can set Autorun Kicker to launch at startup and it can also disable the autorun feature of Windows. It works on all versions of Windows including Windows 7.